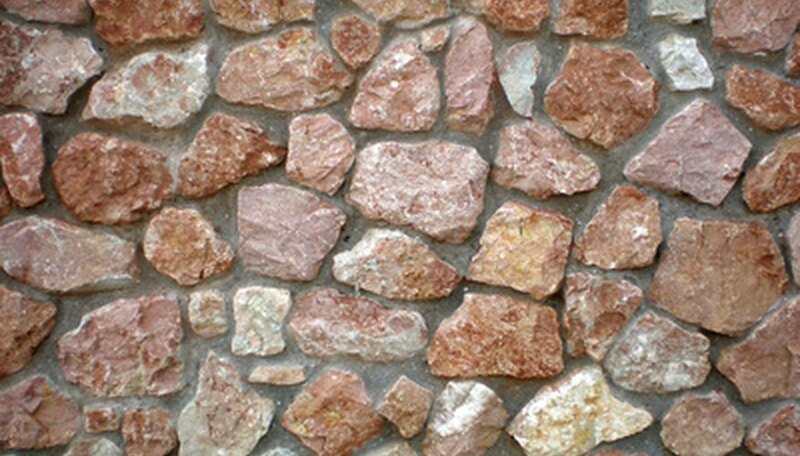 Stone veneer is a manufactured stone building product that is flat on one side and has the appearance of stone on the other side. Adding stone veneer to a concrete foundation wall is a lot easier than many people would expect. The process is straightforward and the end result is a beautiful transformation from a plain concrete foundation wall to an eye-catching stone wall. Clean the surface with clear water and a scrub brush. If the concrete foundation had a sealant applied, use a pressure washer to remove the sealant. Allow the surface to dry before applying the scratch coat. Mix the mortar with water in a 5-gallon bucket or wheelbarrow according to package directions. Scrape the sides well to mix all of the mortar to a consistent, smooth texture. Spread a layer of mortar approximately ½ to ¾ inch thick on the concrete foundation wall. Start from a bottom corner. If the mortar slides on the wall, add more mortar to thicken the batch. If the mortar falls off the wall, add more water to thin the batch. Use a hand rake or mason’s scratcher to create horizontal lines on the surface. Make the scratches about 1/8 inch deep. The scratch coat needs to dry for at least 48-hours. Apply a ½ to ¾ inch thick layer of mortar on the back of each piece of stone veneer. Press each piece firmly on the wall. Give each piece a gentle twist to set it into the scratch coat. Start from a bottom corner and work your way across and up diagonally. If the stone veneer slides on the wall, add more mortar powder to the mortar mix. If the pieces fall off the wall, add a little water to the mortar mix. Press the mortar into the joins with a stick to push the mortar away from the edges of the veneer after placing each piece. Allow the veneer to dry for 24 to 48 hours. Mix grout according to the directions on the package. Fill a grouting bag with grout and slowly press the bag with the nozzle positioned between the pieces of stone veneer. Use a thin grout trowel to level the grout. Plan this project for overcast weather when no rain is expected. Read and follow all safety precautions printed on the mortar mix and grout labels.